Metformin affects cell signaling pathways directly or indirectly at multiple points. For this reason, the drug may be useful against numerous cancer types. Metformin is a drug known for use in type 2 diabetes, but appears to have some benefit in fighting cancer. In diabetes, metformin decreases glucose production by the liver, decreases the absorption of glucose in the intestines, and improves insulin resistance of the cells. Interestingly, metformin began to garner attention in cancer when a study found that diabetics on metformin have lower cancer rates than diabetics not on metformin. That was big news at the time, because diabetics are otherwise known to have higher rates of pancreatic, liver, colon, breast, bladder, uterine, and rectal cancers compared to non-diabetics. Where does metformin come from? Metformin has been used as the first-line drug for diabetes in the United States for the past 20 years, and it has the advantage of lowering blood sugar levels safely without the risk of hypoglycemia (blood sugar which is too low). On a basic level, it makes sense that metformin reduces cancer cell growth and development. Because we know that many cancer cells preferentially use sugar, a drug which helps the body reduce blood sugar levels should also prevent cancer from having as much food for growth. Metformin seems to affect multiple key processes related to cell growth, proliferation, and survival. The drug’s effects on these processes stem from both metabolic and intracellular-signaling activity. First, metformin decreases the amount of glucose produced by the liver and reduces the bloodstream level and cellular uptake of insulin. In turn, the reduced insulin stimulation results in reduced activation of insulin receptors on cell membranes, triggering a cascade of intracellular molecular effects, such as the downregulation of the Ras/Raf/MEK/ ERK and PI3K/AKT/mTOR signaling pathways. One or both of these pathways are often activated in many types of cancer cells. 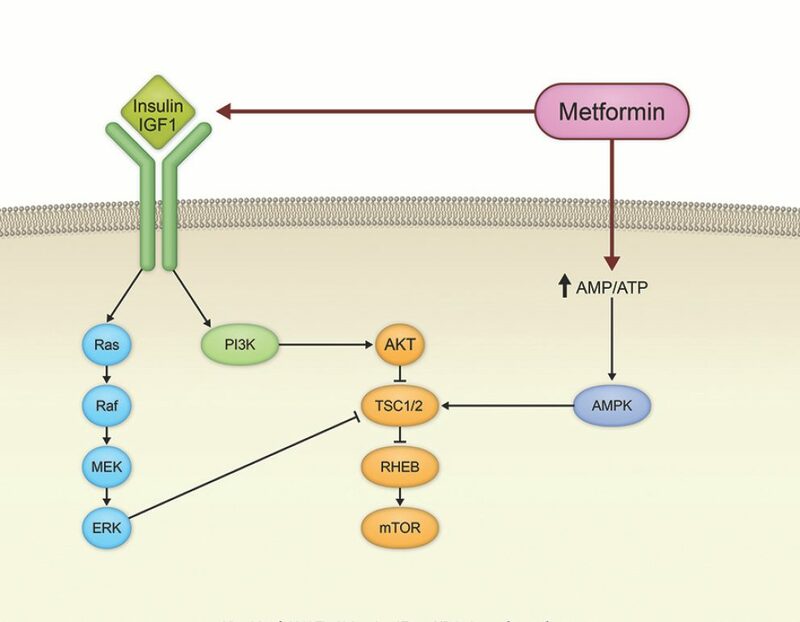 In addition, metformin appears to upregulate AMP-activated protein kinase (AMP-K), a key molecule in glucose and insulin regulation and also an inhibitor of mTOR. Metformin also reduces circulating levels insulin-like growth factor 1 (IGF-1). We know that both insulin and IGF-1 play a role in cancer cells acquiring energy, so reducing both of these also seems to be important in starving cancer cells. Caloric restriction is one strategy which has been shown to reverse the effects of aging. We know that restricting calories results in lower rates of cancer and improved outcomes in patients who are undergoing cancer treatment. Through its up-regulation of AMP-K, metformin mimics caloric restriction in lab studies, meaning that it makes the body’s cells think that calories are being restricted even if they are not. Intermittent fasting does the same thing, which is one reason why I recommend it (especially for cancer patients) - more on this in a future article. Metformin for cancer treatment is used as an off-label drug. Off-label means that metformin was not approved for cancer treatment, but is used in specific cases due to its suspected mechanism of action, its good safety profile, and its results in lab studies. It also has the benefit of being very affordable in its generic form, glucophage. Metformin’s utility for cancer patients may extend beyond treatment and prevention. A group in MD Anderson’s Department of Symptom Research is also studying whether the drug relieves chemotherapy-induced peripheral neuropathy. A recent preclinical study by the group showed that giving mice metformin along with cisplatin (compared with placebo and cisplatin) significantly reduced loss of paw sensitivity and protected peripheral-nerve endings. Despite metformin’s many potential benefits in cancer treatment and prevention, the drug’s use for cancer is still investigational. Several robust clinical trials are under way to examine efficacy and safety. Some precautions are worth noting when prescribing metformin. Although very rare, lactic acidosis can occur with metformin use, particularly in patients with renal issues, so the drug is not recommended in patients with abnormal renal or hepatic function; nor is it prescribed in patients with heart failure. Also, metformin must be discontinued for a couple of days after the administration of an MRI and CT imaging contrast agent. These contraindications notwithstanding, metformin is widely used as an antidiabetic agent because its adverse effects are usually quite manageable; diarrhea, nausea, and vomiting are the most common. Metformin is extraordinarily safe, inexpensive, and it should be able to easily be integrated into cancer therapy.